I bought a jogging stroller for a reason. But that reason comes and goes. In spring and fall I feel motivated to jog. Summer, not so much. It's no fun running in sticky weather. And winter, forget it. Jogging in freezing temps or inside on a track makes the task that much more of a challenge. It's nice out today, I'm home and I'm inspired by my husband's plans to start running. And I need a break from this dissertation work. The perfect time to jog -- if there is such a thing. The last few years I've done the Couch-to-5K program which is supposed to allow my body to adjust to the fact that I'm asking it to do something I don't do very often. Run. I usually get through the nine weeks of the program and then am reminded that I really don't like running. So now that I've communicated my ambivalence for running I'll let you know what I'd really rather do. Swim. But given that we're out in the woods, the closest pool is 20 minutes or so away. That I can handle, but in order to swim laps I have to join a gym (which doesn't make financial sense to do just for swimming) or swim at the my old high school pool which isn't heated and might not have lanes open for lap swim. Long story, short. I need my exercising to be convenient. Running is that. So I'm off. I'll let you know how day one of week one goes ... be back shortly. Not tooooo bad. Before I headed out I downloaded a free running app for my iPod touch called 321run (thanks Jay : ). It lets you know when to run and when to walk so you don't have to use a watch to track the time. Anything that makes the process easier can help keep me moving. 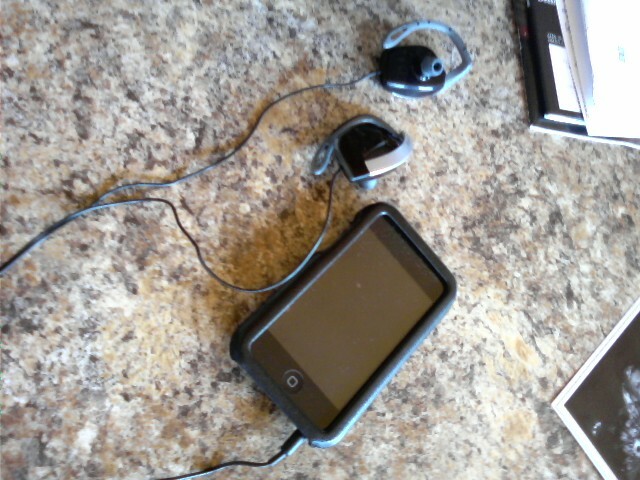 My iPod just might help make me a runner. Nothing can stop me now ... except maybe the snow we're supposed to get tomorrow. Peoples were indeed out and about yesterday. 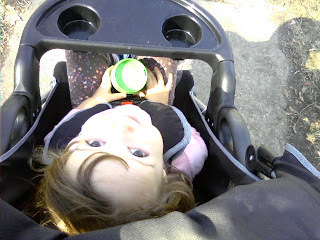 I felt the need to get outside with Grace for a bit, so we took a stroller walk around in town. I contemplated jogging, but that urge left me quite quickly. Just being outside without a bulky coat was refreshing enough. We went around a few parks and through a college campus so there was a lot for Gracie to see. Guess I didn't need to go for that jog after all. Grace had her first (real) haircut this weekend. 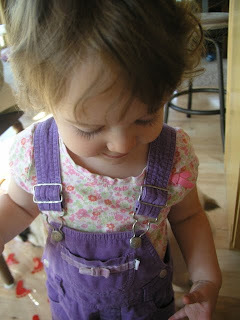 Jay and I have trimmed her bangs a number of times over the past months, but she's never had a haircut-haircut. Gracie has these curly curls. Very cute, but tangly. Her hair was almost to the middle of her back. It was getting caught in bibs and stuck in her mouth. And it was becoming great collector of stray bits of food. It was time. No beauty salon for this girl. 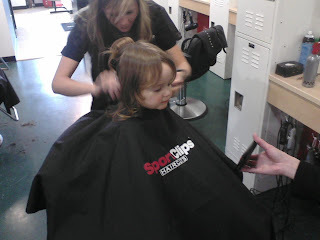 We took her to SportsClips where her dad goes. They have little TVs that we thought might help keep her distracted if things got a bit sad. She had a few seconds of tears, but then caught a look of herself in the mirror. 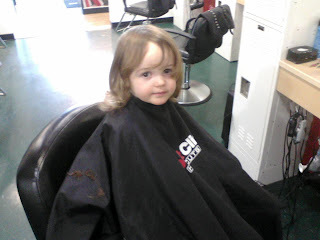 Then she was distracted by the others getting their hair trimmed -- two young boys. And then she realized there was a TV right by the chair. As a true 2010 mom, I brought my ipod touch with as well (that's my hand in the picture). I've loaded some Sesame Street podcasts and other toddler distractions on to the gadget. Three inches were taken off and it made for the perfect length for a toddler. I kinda wanted to go a bit shorter, but didn't have the heart to have them cut out all of the curls ... yet. I've been sick and/or injured for almost two months now and just so you know, I don't deal well with not being healthy. I don't whine about it -- I get frustrated with it. A perfect example: I was coughing so hard a few weeks ago I pulled or tore something in my lower back. I felt a pop and knew that movement wouldn't be particularly fun from that point forward. While I spend my workdays at a desk, I spend my nights and weekends with a toddler. We spend so much time on the floor playing. We also spend time running around -- mostly doing races down the hallway. Some time is also spent on me picking Grace up to console her after a fall, give a hug or transport her to her time out spot. This back thing limited all of that. Grace and I were alone (well Ella was there : ) in the house when my injury happened. As I forsaw my limitations I started to cry out of pain and frustration. Gracie looked at me with her concerned face all scrunched up and asked, "Mommy sad?" I explained, "Mommy's got an owie." She looked at me and said, "I kiss it." The pain, of course, was still there, but my state of mind and heart were all better.